Thus Kohli, sums up one of his key messages: much of the book calls for greater professionalism in coaching – a call that I wholeheartedly endorse. The author rails against untrained, unprofessional coaches, suggesting that many self-styled coaches provide an inferior service, and that “pseudo-coaches… are damaging people” (p162). 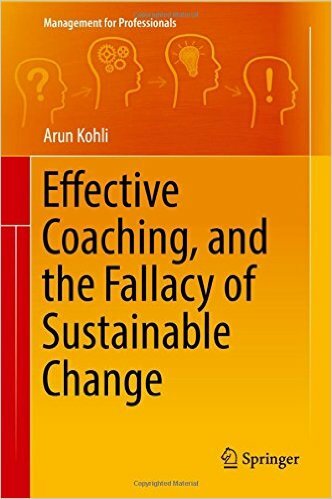 Moving to the other part of the title, Kohli suggests, I believe validly, that the promises of many coaches always to effect sustainable change are misleading and can put off clients. His contention that sustainable change depends on the client is self-evidently true. However, he pushes this argument too far, suggesting that sustainable change per se is fallacious and relies on sophistry to make his point. He cites many examples that belie his own argument. For example, he undertook research with CEOs, finding that as a result of coaching they had seen “visible improvements that made an impact subsequent to coaching”. He also suggests that “coaching is very effective in bringing about a perspective shift” and says that he has “create(d) a method to ensure (his) clients continue to evolve”. These examples all sound like sustainable changes to me! As a coach supervisor, I have some concerns about the way that Kohli describes his coaching work. For example, on p120, he suggests asking a client a closed question, with an inherent assumption about the client’s feelings, and his extensive case studies contain language like “my effort to make him realise” and “after I convinced him” that I would certainly challenge. “Anyone can call himself a coach, becoming a coach is a different dimension altogether”.